As a chiropractor, I love seeing people’s lives changed for the better. Whether it’s a mother finally getting some much-needed rest from a colicky baby or someone with persistent headaches or a bad case of sciatica, Dr Adam enjoys helping his patients enjoy optimal health. Dr Adam uses an assortment of techniques ranging from extremely gentle ones for tiny spines to heavier manual adjustments for larger patients. He frequently uses the Activator® method and has a keen interest in techniques done by hand. In most instances, he recommends stretching and stabilisation techniques to complement the effects of chiropractic care and reduce the risk of relapse while increasing mobility between adjustments. I also enjoy treating sports injuries and working with athletes. I’m currently the chiropractor for both the Lakeside Lightning and Willetton Tigers SBL basketball teams. Outside of work, Dr Adam keeps busy by spending time with his four boys, windsurfing, playing basketball and running. He looks forward to being of service to you and your family. 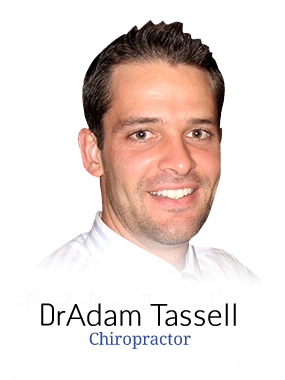 It’s his desire to help you find and maintain peak health through today’s highly safe and natural chiropractic care. Are you a good candidate for chiropractic care? Contact Tassell Chiropractic today to arrange a time to discuss your health issue in person!